Brockhampton Estate at Brockhampton Estate (National Trust)01885 488099work Historic HouseAt the heart of this 687-hectare (1700-acre) farmed estate lies Lower Brockhampton, a romantic timber-framed manor house dating back to the late 14th century. 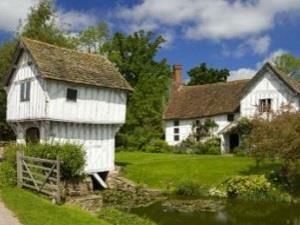 The house is surrounded by a moat and is entered via a charming timber-framed gatehouse, built 1530-40. There are miles of walks through the park and woodland, featuring ancient trees, the picturesque Lawn Pool and various sculptures depicting parts of the history of Brockhampton and the local area. This is home to a rich variety of wildlife, damson orchards, along with historic farming breeds such as Hereford cattle and Ryeland sheep. Steeped in history, Brockhampton has witnessed many changes. Until 2014 the rear rooms in the manor house were being lived in and not open to the public. Over the last few years we’ve focused on peeling back the layers of history to show visitors how seven centuries of occupation have shaped the building we see today. For example, the original medieval great hall had an upper floor inserted into it by the family, in order to accommodate their many children. Brockhampton invites visitors to discover more about key figures from the building’s past; you are invited to rummage in cupboards, join in games in the 17th century Parlour, or relax with a good book in the fireside comfort of the inter-war sitting room. At the heart of this 687-hectare (1700-acre) farmed estate lies Lower Brockhampton, a romantic timber-framed manor house dating back to the late 14th century.